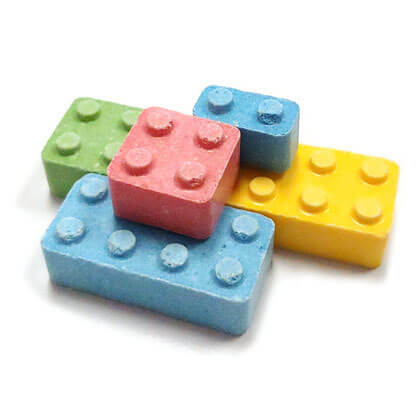 These sweet candies look and build just like Legos! In a fruity assortment of pineapple, orange, raspberry, banana, cherry, grape and lime. 8 oz. Colors and sizes vary, but approx. 11 blocks per oz. Ordered the candy blox for Lego themed cupcakes. I called to check on the shipping status, and the gentleman was so very nice and helpful. They arrived quickly and in great shape. They were really yummy too. I will definitely order from Pearls again. Perfect solution for decorating my "Lego Man" cake! Loved how they actually fit together like legos as well!